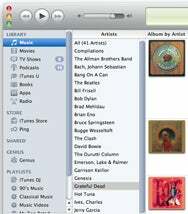 When you want to find a specific song or album in your iTunes library, you can use the Search field at the top-right of the application’s window and type part of its title. But one efficient way to access the content in your iTunes library is to use the iTunes Column Browser. Curiously, Apple doesn’t like showing iTunes with the Column Browser visible: the company tends to want to show big icons in Grid view, or even bigger covers in Cover Flow view. (I discussed the different iTunes views in an earlier article.) But the Column Browser is an effective way for drilling down into your music, books, and videos, and also a way to get an overview of your content. Here’s how it works, and how you can use it to make navigating iTunes easier. When viewing any of your libraries or playlists in iTunes, you can display the Column Browser: to do so, press Command-B, or choose View -> Column Browser -> Show Column Browser. By default, if you’ve never used the Column Browser before, it display at the left of your content. Here's the column browser in its simplest form, displaying at the left of a music library. iTunes displays just one column in the browser at first: the Artists column. But you can add more columns by choosing View -> Column Browser and checking the columns you’d like to display. You can choose among Genres, Artists, Albums, Composers, and Groupings. You can also choose to group compilations and use album artists if you wish. The principle of the Column Browser is simple: each time you select an item in the first column, the number of items shown in the second column reduces. So if you have, say, Genres in the first column (you can’t change the order of the columns you choose to display), clicking on one genre only shows those artists whose music is in that genre. Clicking on an artist whittles down the selection in the main part of the iTunes window to just the music by that artist. And so on. The column browser seems more logical to me when it displays at the top of the window. But before you decide to use the Column Browser in its default location, try out displaying it at the top of the window, by choosing View -> Column Browser -> On Top. With the Column Browser at the top of the window, your lists in the individual columns will display less, yet having additional columns doesn’t eat into the space used to display information about your content. The above screen shot shows just three columns, Genres, Artists and Albums, but you can choose, as with the left-sided Column Browser, to also display Composers and Groupings if you wish. You can also change the amount of space the Column Browser takes up by dragging the separator between it and the list view section of the window. When you choose to display the Column Browser in one part of iTunes, it doesn’t display everywhere. If you display it while in your Music library, it won’t show up in your Movies, TV Shows, or Books libraries, for example, or in any of your playlists. You need to turn it on for each item where you want to use it. You may find it useful—as I do—to show the Column Browser in your Music library, because it makes it much easier to find content (most of us have a lot more music than any other media type in iTunes). Instead of searching for your content when you want to play an album, it’s much easier to click on a genre, then an artist, then an album to play it. But in, say, your Movies library, unless you have a lot of movies, you won’t gain much by using it. You can use it in any playlist, and there are some cases where this may be useful. If you group all the albums of a certain artist in a playlist, for example, using the Column Browser (in this case, displaying it on the left is the most logical) lets you select an album by clicking its name in the Albums column. I also find the Column Browser useful in my Books library, as I can see the names of all the authors present there, and select any of them easily. If you have a lot of TV shows, this is practical is well. So if you don’t use it, try out the Column Browser. 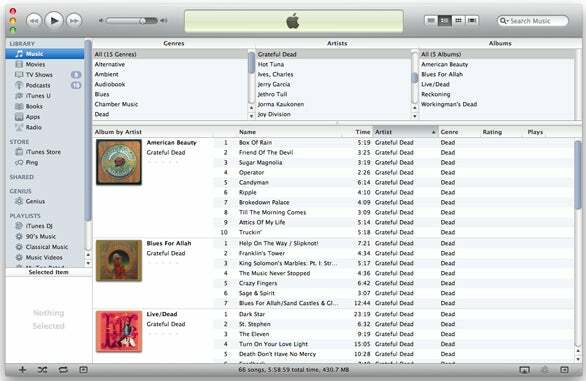 It’s an efficient way to navigate among your iTunes content, and makes it easier to find, and play, what you want.